When shoppers investigate products, one of the first places they explore on your product page is the list of product reviews. About 70 percent of customers consult reviews before making a final purchase and 93 percent say reviews influence their shopping decisions. This means an easy way to get more sales is to ask for product reviews. Why are product reviews important? Product reviews boost conversions by leveraging the Diffusion of Innovations theory. This theory explains that social proof is necessary for most buyers to make a purchase (product reviews are just a kind of social proof). Essentially, a majority of customers require some kind of proof before trying a new product. Only a small percentage of buyers are willing to try something new. If you don’t show the majority that your products are trendy, popular, and desirable, they won’t have enough information to make a decision. So it’s important to collect reviews as early as possible to get your products past the innovators and early adopters to the majority of buyers. None of that is surprising, of course. Personal recommendations have always been important to shoppers. Product reviews are basically just word of mouth. Customers spend 31 percent more with businesses that have a lot of excellent reviews. According to BrightLocal, 85 percent of shoppers trust online reviews as much as personal recommendations. Nielsen found the same thing. Customers use reviews to mitigate risk, gather more information, and prevent making a decision they might later regret. By displaying customer reviews on your site, you help shoppers feel safe and informed about their decision. Reviews are also good for SEO. Product pages are traditionally hard to rank because they’re lighter on content than, say, a blog post. 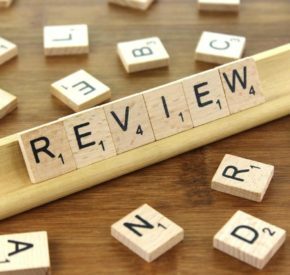 By adding reviews, you give search engines more content to read and evaluate. This is especially important for stores who rely on search traffic. Besides, people actively search for product reviews (by searching [product name] + review), so you’ll want to give them everything they need to make a buying decision. So you know product reviews are important, but that begs the question: How do you get them? Well, you have to ask. As an eCommerce store, the only way to do that is by email. Naturally, you don’t want to manually send an email to every customer after they make a purchase, so instead you can set up an automation. How you automate this process will depend on your shopping cart and email marketing tool. If you use Jilt, you can quickly set up a post-purchase campaign that sends a series of emails to every customer within a certain period of time after purchase. If you haven’t collected reviews in the past, it’s worth reaching out to your past customers as well. When Concourse Sports (a sporting equipment retailer) contacted all their old customers, they increased their reviews by 2800 percent. When Yotpo studied product review requests, they looked at 3.5 million emails. They discovered that subject lines with emotional words don’t have a positive impact. Emotional words include words like “smile,” “love,” “like,” “happy,” etc. 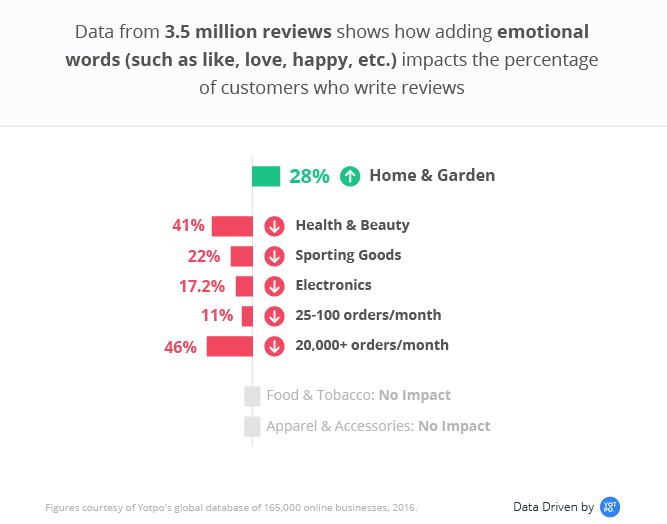 This is especially true for health, beauty, electronics, and sporting goods where conversions (people submitted a review) were up to 41 percent lower. Home and garden products didn’t follow the trend, however. Emotional words in the subject line increased the conversion rate by 28 percent on average. 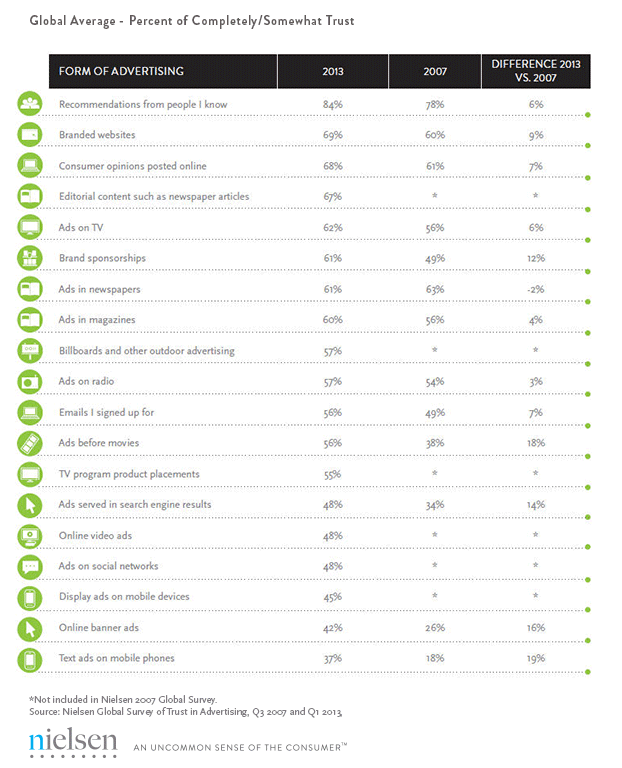 Asking questions increases conversions by 15.7 percent on average. Exclamation points don’t much impact unless you sell food or tobacco, in which case exclamation points create a massive 83.5 percent increase in conversions. Using at least one UPPERCASE word causes a significant decrease in conversions for every industry except electronics (which sees a fair increase). Words that imply a financial incentive (“win,” “free,” “discount,” “save,” etc.) get 18.5 percent more reviews on average. Adding the store name boosts conversions by 3.7 percent on average. If it takes you two days to pack and send the order and another four days to arrive at your customer’s home, it doesn’t make sense to request a product review the day after purchase. Similarly, if you know a majority of your customers use your product on the weekends, you’ll want to tack on an additional seven days before requesting the review. This way you can be reasonably sure they used it before you ask them to rate it. Personalization is an important part of email marketing and post-purchase emails are no different. Fortunately, review requests are inherently personalized to a degree since you only send them to people who have already made a purchase and the emails relate to that purchase. Take personalization further by mentioning the customer by name in the email and showing them a picture of the product they purchased. 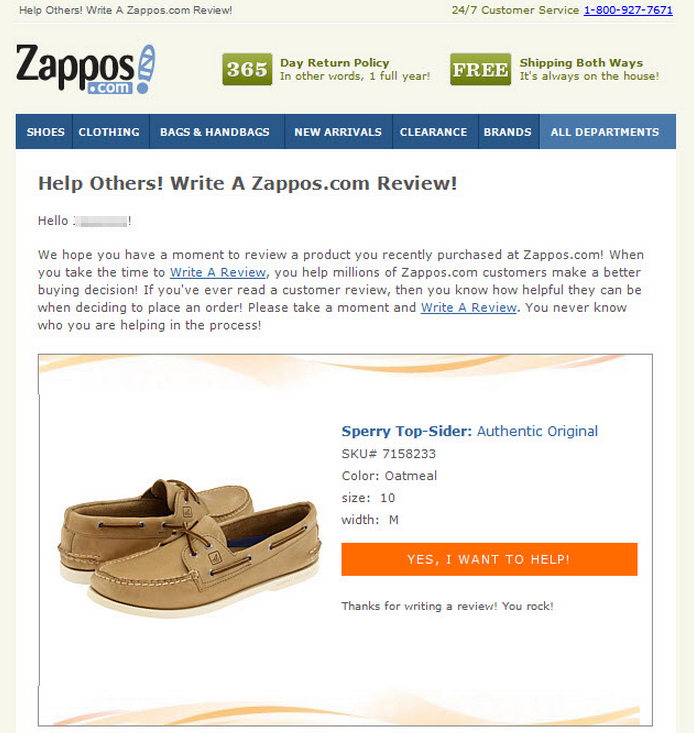 This Zappos review request email does both well. On a personal level, you don’t want your customers to have a bad experience with your products, but you can’t please everyone. At some point, you’ll sell to a customer who isn’t happy with their purchase and chooses to leave a negative review. However, you shouldn’t hide those bad reviews. As long as there aren’t too many negative reviews, they can actually improve conversions. Around 68 percent of consumers trust reviews more when there are some bad ones mixed in. When all the reviews are positive, 30 percent of consumers suspect the reviews are fake. If you get a lot of negative reviews, however, it’s best to suspend your review requests until you figure out what’s wrong. Bonus: More on why some bad reviews are a good thing for your store. Like most emails you send, your review requests should have a single purpose. Don’t package your requests with unrelated promotions, news, or information. Don’t overwhelm your customers with long-winded paragraphs about how much you value their support and their “commitment to your mission.” Get to the point. Include one call-to-action that links directly to the page where your customer should leave their review. Don’t ask them to find anything on their own. If they become confused or have to spend time finding the right place, there’s a high chance they won’t bother completing the review. Furthermore, be specific with what you want. If you want a five-star review, ask for it. If you want details, ask for them. It may seem silly, but subtle cues are highly influential. 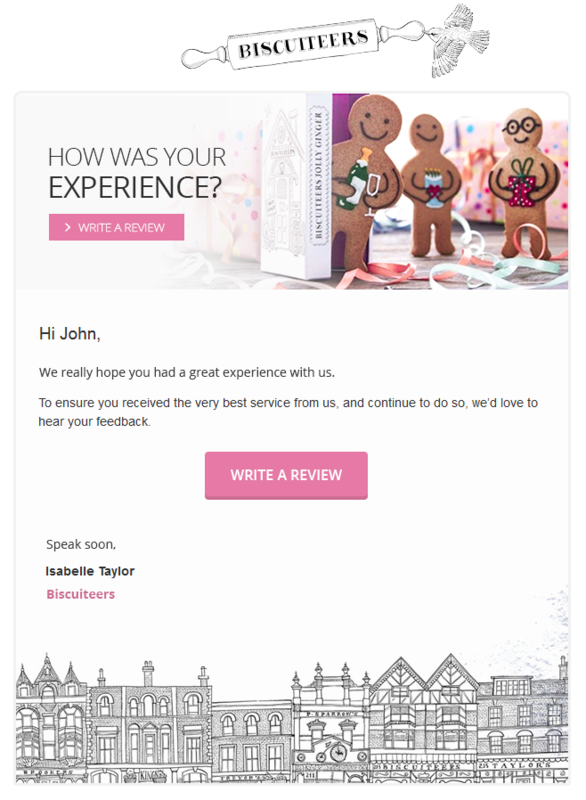 This Biscuiteers email is a great example of how to keep things simple. It’s branded, but not obnoxiously. There’s no doubt what they expect the recipient to do. If you’re comfortable giving out discounts, a coupon code can be a powerful incentive for your customers. More than half of consumers say they would write a review of the store offered them some kind of incentive. Plus, it will encourage them to make an additional purchase that they normally wouldn’t have. 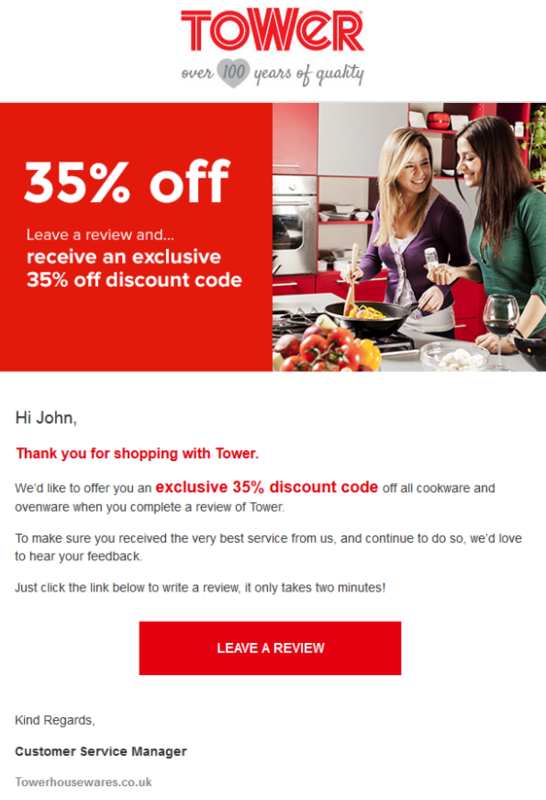 For best results, make the discount the focus of the email because that’s the real value to the recipient, like this review request from Tower. Contests and giveaways are other popular types of incentives. You can offer to enter the recipient into a giveaway if they submit a review. This is a less tangible reward than 20 percent off their purchase but it might be right for your audience. Take care when using coupons to drive sales, however. There’s a legitimate concern that you might devalue your brand or condition your customers to only buy when they have a deal. Besides, coupons aren’t right for every brand. If your customers don’t expect to use coupons, don’t offer them. Not sure how to phrase your product review request emails? Use these customizable templates for inspiration. Since product review request emails are so simple, they’re easy to test. They don’t have many elements to optimize. There’s a subject, a little bit of body copy (not too much), a call-to-action, and possibly an incentive. It shouldn’t take long to optimize your campaigns. Once you’re happy with their performance, you simply let the reviews roll in and drive more sales. Not sure how to phrase your product review request emails? Use these customizable templates for inspiration. Subscribe to receive this extra resource and our newsletter.